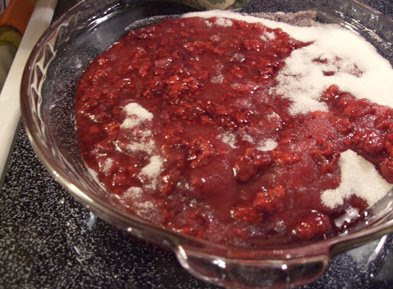 Easy raspberry jam is stirred into the brownie batter. I am a brownie woman. Make that a fudgey brownie woman. Forget cakey brownies. If I want a chocolate cake, I’ll make one, thank you. And let’s skip frosting. A fudgey brownie needs, at most, a sprinkling of powdered sugar. These brownies — my favorite brownies — show up mid-summer, when my raspberry bush is filled with fuzzy, juicy fruit. That’s because these brownies — devil brownies — are laced with homemade jam. Why call them devil brownies? Self-control goes out the window with these tempting treats. They’re baked in a 9-by-13-inch Pyrex pan, and every time I walk past the pan, I take a finger brownie — a brownie the width of my finger. (You can see how this is dangerous.) Blast you, devil brownies! The jam, the sweet twist in these black beauties, almost isn’t a recipe, but it’s most definitely a capital idea. Heat equal parts sugar and berries in the oven; pour the hot sugar over the hot berries. The raspberries crackle as they turn into hot pink lava. 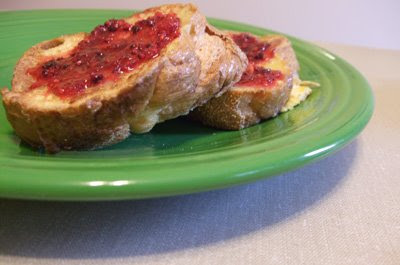 Easy jam on toast is a sweet breakfast treat. The exterior of the brownies is a little crusty, but their interior is chocolate magma. It’s like creating a pan of brownie tectonics. (Maybe I should rename these “volcano brownies.” Lots of allusions to volcanoes and such.) These brownies, a friend remarked to me, are baked just enough to hold together. They firm up over a few days. You must be warned: Devil brownies will fill your house with waves of chocolate perfume. Eating them is like sitting in a hot tub too long. You feel a bit woozy because the activity is physically consuming. Imagine eating chocolate-flavored velvet. There’s only depth to these lovelies; no light escapes from them. Berries and sugar, jam is your destiny. If the taste and mouthfeel weren’t enough, the brownies are criminally easy to make. It’s a one-bowl operation. It’s best to bake them the day before you want to serve them; the flavor deepens overnight. I leave the pan on the counter instead of putting it in the fridge to keep them soft. A generous rectangle of brownie pairs well with a stout. I understand if you don’t want to share these chocolate bombs. The devil brownies made you do it. I’m itching to make this jam with other berries. In the fall, I may make it with finely chopped apples and some lemon juice. This recipe makes about 1 1/4 cups. Preheat the oven to 350 degrees Fahrenheit. 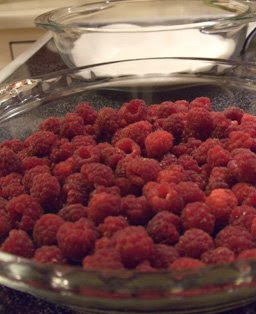 Put the raspberries and sugar in two separate bowls. Pie plates work well. Put the bowls in the oven for 20 to 25 minutes. 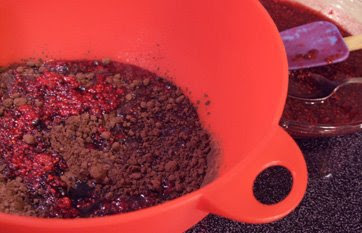 Remove bowls from oven, and pour the sugar over the berries. The berries will pop, crackle, and liquefy. Give the berries a gentle stir to even the consistency, but don’t get rough with them. Pour the jam into a jar, and keep it in the fridge. As the jam gets older, the sugar with get a bit crusty. It still will taste OK; give the jam a stir before you use it. One of these days, I may make the brownies with another type of jam. Orange marmalade could be good, if you’re into the chocolate-orange combo. One of the great things about the KAF cookbook is that it gives weights for ingredients, which is the most exact way to bake. King Arthur Flour recipes are foolproof. I also highly recommend the King Arthur Flour blog, Bakers’ Banter. 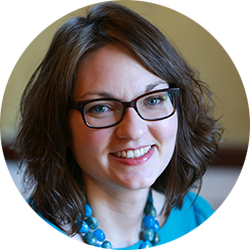 Recipes are laid out step-by-step with photos, and the bloggers, who are KAF bakers, are active in the comments section. Have a baking question? They can answer it. Preheat oven to 325 degrees Fahrenheit. In a medium bowl, whisk together the melted butter, cocoa, sugar, salt, jam, and flavor. (OK, so it’s not entirely a one-bowl recipe unless you melt the butter in the medium bowl. Maybe your microwave is big enough for a medium bowl.) Stir in the eggs, flour, and chips. Pour the almost-black batter into a lightly greased 9-by-13-inch pan. Bake the brownies for 28 to 32 minutes. I checked them at 29 minutes (because my oven is a little cold). I checked them after another three minutes and decided to bake them for still another three minutes. In total, they were baked for 35 minutes. I am paranoid about overbaking brownies. That’s a high crime of baking in my book. A cake tester will come out mostly clean when they’re finished, but error on the side of underdone. They will firm up as they cool. Storing the brownies in the fridge with firm them up even more. « Who needs a yogurt maker? 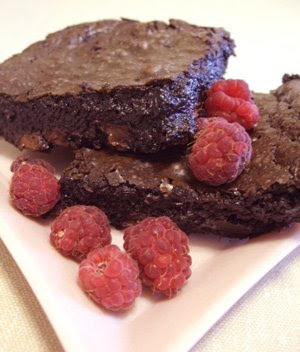 So, I did a U-turn on Highway 11 to buy fresh raspberries today, with the express purpose of making devil brownies. I have no Dutch process cocoa, but think the recipe will survive a cocoa powder substitution. I shall post more upon completion. You know, the Dutch process cocoa is a really beautiful color — that super dark brown. But I don't think it makes much difference in terms of taste. Anybody else have strong feelings about cocoa? And, the brownies were tasty, but I think I overcooked them. I'll try again one of these days. Also, I think my raspberries were too watery.